The derma-purifying shampoo helps prepare for a complete thickening treatment. Specially developed for colour-treated hair with light thinning, the professional shampoo performs a deep cleanse on the hair and scalp. It utilises Glyco-Shield 2.0 technology to remove sebum, fatty acids and other urban residues from the scalp and hair to create a healthy environment for thicker, fuller-looking locks. Cleansing and amplifying, the shampoo will leave hair feeling strengthened and resilient. Step two of the brand's 3-part treatment, the professional formula delivers long-lasting moisture and hydration, whilst enhancing colour vibrancy for radiant, healthy-looking hair. Powered by a Transactive Delivery System and Pro-Color Shield technology to amplify hair texture and provide colour protection. Thinning hair looks denser and fuller. The leave-on scalp treatment has been specially developed for colour-treated hair experiencing light thinning. Working to refresh the scalp while improving hair volume, the professional hair formula utilises Transactiv Delivery System 2.0 and works by increasing the fullness of each strand for enhanced diameter. 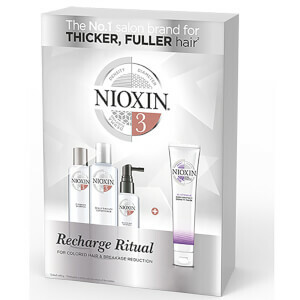 Encourages thicker-looking hair while refreshing the scalp and adding healthy shine to tresses. A nourishing hair mask that leaves hair manageable and smooth while delivering targeted density care. Ideal for dry, damaged or coloured, thinning locks, the caring thinning treatment is powered by DensiPROTECT Technology, which combines lightweight conditioning agents that strengthens the hair shaft against damage, reducing breakage. Hair Mask: Use as needed after shampooing. Work evenly through hair. Leave on 3-5 minutes. Rinse well. Shampoo: Aqua, Sodium Laureth Sulfate, Sodium Lauryl Sulfate, Citric Acid, Sodium Chloride, PPG-2 Hydroxyethyl Coco/Isostearamide, Sodium Citrate, Sodium Xylenesulfonate, Sodium Benzoate, Salicylic Acid, Sodium Hydroxide, Tetrasodium EDTA, Mentha Piperita Oil, Mentha Arvensis Leaf Oil, Menthol, Trisodium Ethylenediamine Disuccinate, Methylparaben, Polyquaternium-10, Propylene Glycol, Camellia Sinensis Leaf Extract, Cystine Bis-PG-Propyl Silanetriol, Biotin, Lecithin, Niacinamide, Panthenol, Tocopheryl Acetate, Foeniculum Vulgare Fruit Extract, Sodium Acetate, Isopropyl Alcohol, Faex Extract, CI 42090, Acer Saccharum Extract, Citrus Limon Peel Extract, Saccharum Officinarum Extract, Vaccinium Myrtillus Leaf Extract, Citrus Aurantium Dulcis Fruit Extract, Potassium Sorbate. Conditioner: Aqua, Sodium Laureth Sulfate, Sodium Lauryl Sulfate, Cocamidopropyl Betaine, Sodium Citrate, Sodium Xylenesulfonate, Sodium Chloride, Cocamide MEA, Sodium Benzoate, Citric Acid, Salicylic Acid, Mentha Piperita Oil, Mentha Arvensis Leaf Oil, Menthol, Tetrasodium EDTA, Sodium Hydroxide, Methylparaben, Propylene Glycol, Camellia Sinensis Leaf Extract, Cystine Bis-PG-Propyl Silanetriol, Biotin, Lecithin, Niacinamide, Panthenol, Tocopheryl Acetate, Citrus Paradisi Peel Extract, Humulus Lupulus Flower Extract, Urtica Dioica Leaf Extract, CI 19140, Faex Extract, Acer Saccharum Extract, Citrus Limon Peel Extract, Saccharum Officinarum Extract, Vaccinium Myrtillus Leaf Extract, CI 42090, Citrus Aurantium Dulcis Fruit Extract, CI 17200, Potassium Sorbate. Scalp & Hair Treatment: Aqua, Niacinamide, Caffeine, Phenoxyethanol, Sodium Benzoate, Benzyl Alcohol, Acrylates/C10-30 Alkyl Acrylate Crosspolymer, Polysorbate 60, Polysorbate 80, Acetamide MEA, Triethanolamine, PEG-23M, Tetrasodium EDTA, Propylene Glycol, Methyl Nicotinate, Parfum, PEG-30 Dipolyhydroxystearate, Mentha Piperita Oil, Mentha Arvensis Leaf Oil, Menthol, Trideceth-6, Camellia Sinensis Leaf Extract, Limonene, Silica, Cystine Bis-PG-Propyl Silanetriol, Biotin, Lecithin, Tocopheryl Acetate, Foeniculum Vulgare Fruit Extract, Faex Extract, Acer Saccharum Extract, Citrus Limon Peel Extract, Saccharum Officinarum Extract, Vaccinium Myrtillus Leaf Extract, Citrus Aurantium Dulcis Fruit Extract, Potassium Sorbate. Hair Mask: Aqua, Stearyl Alcohol, Behentrimonium Chloride, Cetyl Alcohol, Bis-Aminopropyl Dimethicone, Isopropyl Alcohol, Phenoxyethanol, Benzyl Alcohol, Parfum, Methylparaben, Propylparaben, Disodium EDTA, Propylene Glycol, Polysorbate 20, Vaccinium Myrtillus Leaf Extract, Saccharum Officinarum Extract, Citrus Limon Peel Extract, Acer Saccharum Extract, Citrus Aurantium Dulcis Fruit Extract, Hydrolyzed Silk, Aleurites Moluccana Seed Oil.